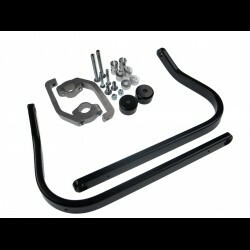 To fit tapered (Fat Bar) handlebar. Compatible with VPS or STORM guards (each sold separately). After extensive trials these are the ONLY handguards that WE have found work in conjunction with the Renthal 609 RC High Fat Bars and our Fat Bar Riser kit for the CB500X, and still clear the screen, in the lower position, at full lock. If you require the screen in the raised position, we can supply a Spacer Kit to enable this. After extensive trials these are the ONLY handguards that WE have found work in conjunction with the Renthal 609 RC High Fat Bars (RRP 484/485) and our Fat Bar Riser kit (RRP 825) for the BMW G310GS with either our Sport Screen (RRP 848) or our Adventure Screen (RRP 849) , and still clear the screen at full lock. 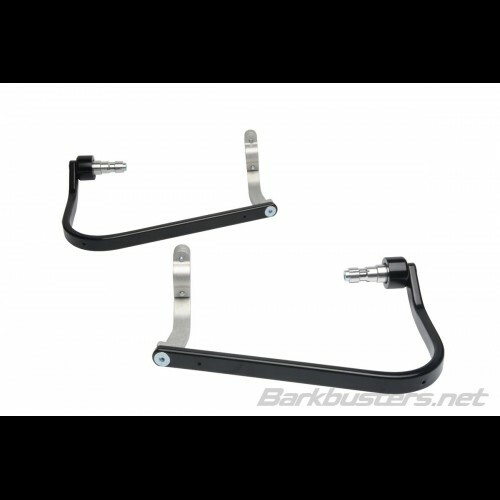 Until we have our Short Folding Levers in stock (end April) then the very long OEM levers do not fit inside the Barkbuster metalwork. We have found that it is possible to run the levers slightly underneath the metal frame OR trim the last 20mm off the levers, where the slot is, and the file the cut end. This will then allow the levers to fit behind the metalwork, for maximum protection.